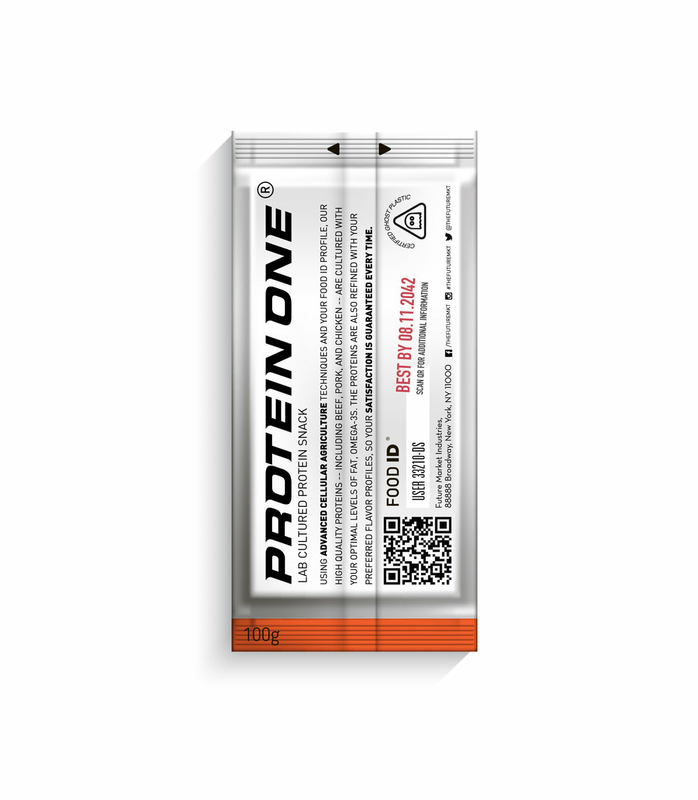 Protein One is the only meat-based protein snack you’ll ever need. Customized to your individual requirements, our premium jerkys offer unsurpassed nutrition and taste in a convenient, on-the-go package. Using advanced cellular agriculture techniques and your Food ID profile, our high quality proteins -- including beef, pork, and chicken -- are cultured with your optimal levels of fat, omega-3s. The proteins are also refined with your preferred flavor profiles, so your satisfaction is guaranteed every time. Keep a pack in your desk, handbag, or carry-on for a craveable and always nutritious snack. Protein One is an unrivaled protein snack made entirely with you in mind. Our high quality meats are unmatched in freshness and nutrition, making the best tasting jerkys in the world. Conventional jerky is a thing of the past. We use advanced cellular agriculture techniques to culture the finest beef, pork, and chicken, as quickly as you need them. Enhanced with your Food ID profile, we modify fat content, omega-3s, and flavors to suit your nutritional requirements and taste. We then take our premium proteins through a state-of-the-art dehydration process that results in superb texture. The protein is sliced and packaged in convenient to-go packs to support your busy lifestyle. Our snacks are made with precision and accuracy, bar none. Never do you have to think twice about the quality of your protein or the flavor of your food. Protein One is reliably packed with everything you need to power through your day. Get yours in-store, online, or via automated subscription delivered directly to your home. Protein One -- Protein, precisely. Protein One was inspired by the following movements, technologies, and trends in food today. Microbiome: The human microbiome is the complete ecosystem of microbes living in our bodies. These trillions of microbes help digest our food, absorb nutrients, and fight disease. Microbiome health is strongly believed to have an impact on our overall well being. Precision Nutrition: The concept that food can be hyper customized to the needs of an individual, based on some data about that person’s health, tastes, and preferences. Customization can occur in broad ways (making your own smoothie with specific kinds/amounts of protein) or much more precise methods (creating a custom blend of vitamins and mineral supplements based on blood tests). On-Demand Food: Food that can be made to order, from scratch, at near-real time speed following the eater’s request. On-Demand food can also be made to accommodate a high degree of customization, enabling precision nutrition to happen in an efficient manner. Food 3D printing plays a large role in making truly on-demand food a possibility.